This track runs parallel to the Thomson dam wall. It provides amazing views of the dam wall and needs to be seen in person to fully appreciate the engineering that has gone into the construction of the dam wall. We started at Walhalla Rd end and as the track winds you between the trees you are lulled into a false sense of this being a sedate track. Make no mistake this is a steep track and given a little rain it could make it undriveable. 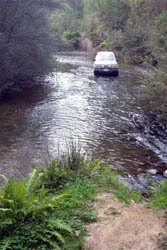 At the bottom the track crosses the Thomson River. This can be a dangerous crossing and at first it isn\'t very obvious where the exit is.